Thanks for all your input so far on the poll and in the comments! There's still a couple days to vote, if you haven't yet. Mr. Mitten and I have been discussing the results already. Some are pretty obvious, like the numbered rows, since I had a poll about that already. I've started doing that with all the patterns I've been working on recently, so expect to see it in any new or revised patterns. Other ideas I find very exciting or intriguing. Some I can try to get to soon, some will have to wait a while because we don't have time, or it's not feasible with the way my shops are set up right now. Anyway, we'll give you a better idea of things to come once we've seen the final poll results, and figured out the best way to meet the most popular ideas. I wanted to let you know we've decided to change a couple of patterns in the Fuzzy Knits book, so there is no overlap in toy patterns between the two books. The new patterns will be similar to the Big Teddy and Squirrel, but still unique from those in Festive Knits. I'm going to keep them a secret until the new version is released, but maybe I'll get a couple of photos for sneak peeks, once they're done (I'm having a terrible time designing the face of one, but I'll get there eventually!). Also, we are working on ways to get you the updated versions of the patterns and books, without you having to buy them again. If you bought something on Lulu, it's very important to save your receipt, since I have no way to check what a customer buys there. I'll post more info once the first of the patterns are ready. Posted by Barbara Prime at 7:44 a.m. The little half-round pillows that people use as head-rest on board planes or in front of TV, they could use a fun shape in your style. August 10, 2009 at 9:58 a.m. I love the new panda face - very sweet!! I am looking forward to seeing what you come up with!! Good luck with it all!! August 10, 2009 at 6:41 p.m.
August 14, 2009 at 9:08 a.m.
Have I said I like the new Panda face? I do! I'm excited about the remake and I hope I saved my receipts! But if I didn't, the new versions will be available separately, right? August 16, 2009 at 9:28 p.m.
Ooooooooh, I didn't save my receipt for the Panda .... 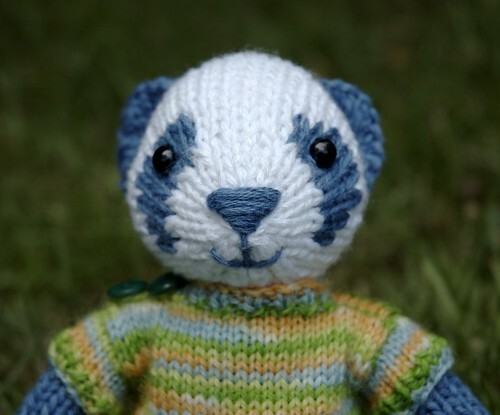 I much prefer the knitted bits around the eyes ... maybe you could *post* these couple of rows on your blog so we can still use the old head pattern rather than buying another one? August 20, 2009 at 4:14 p.m.